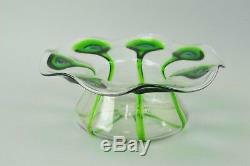 Heading : Art Nouveau trailed glass Albany pattern bowl. 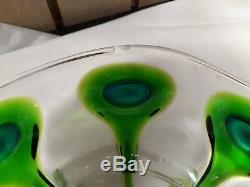 Colour : Clear slightly yellow tinge with green and blue. Body : Crimped bowl with green peacock eye clear trailing and ribbed moulding. Condition : Small chip on rim. Additional Information : Stuart and Sons are renowned for this style of decoration. They were based in Stourbridge where other well-known glass makers were also founded such as Stevens & Williams, Thomas Webb and Richardson. The item "ART NOUVEAU STUART & SONS GREEN PEACOCK EYE & TRAILED GLASS BOWL C. 1905" is in sale since Friday, January 18, 2019. This item is in the category "Pottery, Porcelain & Glass\Glass\Date-Lined Glass\Art Nouveau (c. The seller is "rsampson-uk" and is located in Chulmleigh, Devon.